Just in less than 10 days, Huawei will unveil the Honor 8, that is on July 11 but already we have got some information regarding the phone, which will come with dual cameras on the back. The Honor 8 will have dual cameras just like the P9 and Honor V8. 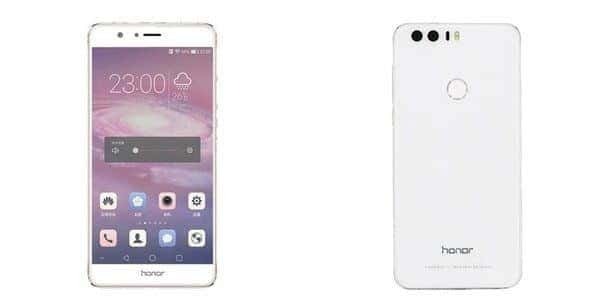 But we have already spotted renders of Honor 8. Now, it will be interesting to see how the phone competes with P9 and Honor V8. The front camera and sensors are placed at the same location as that on Honor V8, along with almost same look if you consider the fronts of both the phones. But you can tell the difference by looking at the screen size of both the phones. But there are major differences if you look at the back sides of both the phones. On the Honor V8, the camera lenses are covered by a single glass and also both the LED flash and laser are placed horizontally, but on Honor 8 the lenses have separate protective glass coverings and also the LED flash and laser are placed vertically just beside the camera. Another thing that is slightly different in terms of the look on the Honor 8 is the fingerprint scanner, which is completely round, whereas on Honor V8 the fingerprint scanner has a kinda slight square look. The phone will come with a 5.2 full HD 1080p display and will come in 3 versions. However, all the variants will be powered by the same processor, i.e. a Kirin 950 processor clocked at 2.3GHz. there will be dual 12MP sensors on the back on all three variants and there will be an 8MP camera on the front. The phone will be juiced by a 3150mAh battery, and will support fast charging. The phone will come with Android 6.0 out of the box with Huawei’s very own Emotion UI on top. So, mark your calendar for the launch of Honor 8. What do you think about the dual camera setup on Honor 8? Another reason to buy Honor 8 or just a minor upgrade? Would spend around $300 for this phone or will consider something else? Let us know in the comments section below. Also, don’t forget to join us on Facebook for all the updates, news, and leaks on the go.